"Mystery" Sale at Lulu: The More You Spend the More You Save? The entire collection of Nod magazines by John Stater. These issues are ABSOLUTELY PACKED WITH GOODNESS! There ain't no dungeon like a whitebox dungeon, 'cause a whitebox dungeon don't stop. Hollah! Fight On! #13, to which I contributed a few illustrations. 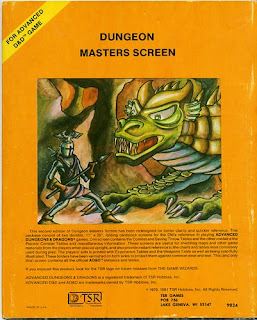 And, of course, a print copy of the d30 DM Companion. Feel free to use the comment area to shamelessly plug your Lulu wares as well! "The Big Plastic Boulder of Nerdiness"
"... who the gently caress has a d30 anymore?" "Who the gently caress ever had a d30? What does a d30 even look like?" "The D30 is a goofy novelty die with no particularly useful applications that I know of. If you really need to dink with big numbers you can just rock percentile, without having to sling around this big plastic boulder of nerdiness +30." Old school gaming, encapsulated in a single sentence." They may have said it out of sarcasm, but I looked at that comment and said to myself, "Yes! Exactly." 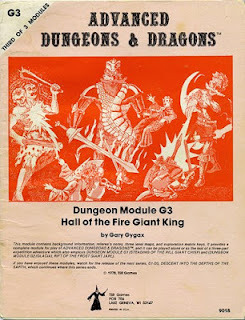 I'd like to thank both Greg Welty for his review at RPGNow and Fenway5 at the Sword and Shield blog for their time to earnestly examine the d30 DM Companion, which began as little more than a series of weekly posts in an effort to bring the d30 to the forefront of the gaming table. Now that DCC is growing in popularity and obliging folks to assemble some very specific Zocchi dice, the competition is getting stiffer for your polyhedral attention. All of those lonely d30s and I both appreciate it. 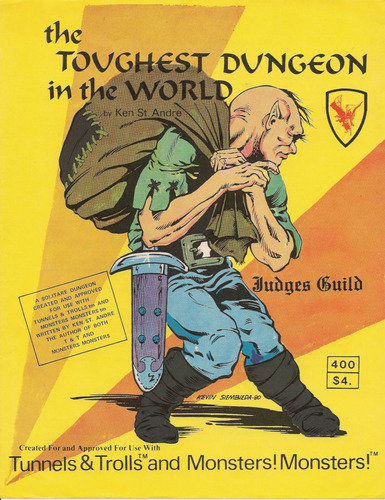 "'Aren’t there lots of random tables already out there on the interwebs, produced for free by the denizens of the OSR?' Yes, there are, but LeBlanc has optimized these tables to get you maximally diverse output for minimal rolling." "What I like is these charts are the sort of core random charts I would want to reference and use frequently in my DM bag of tricks during gaming. Ready Reference has many more esoteric charts or even campaign level charts...but frankly I never used them frequently. I guess it is closer to Monster & Treasure Assortment, but it has MUCH MORE variety and as a DM reference book, more overall utility." Buy the interactive PDF of the d30 DM Companion at RPGNow. 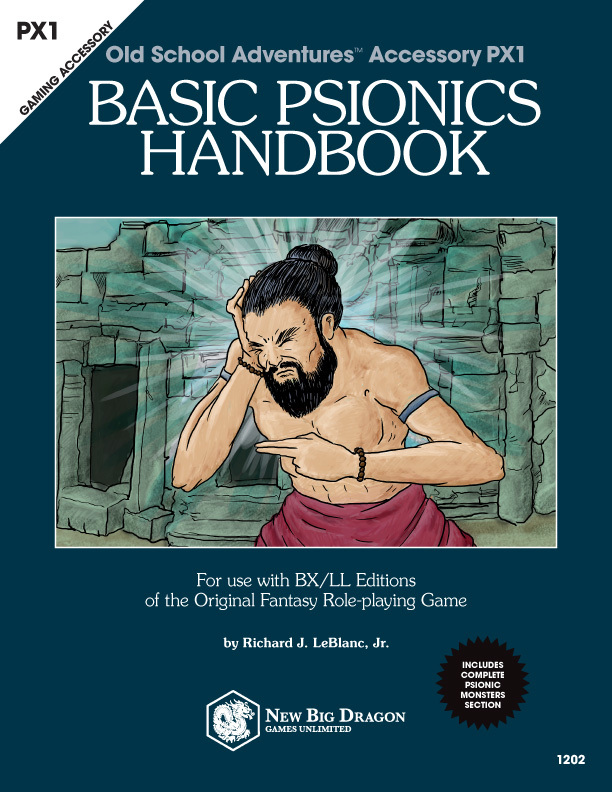 Buy a print copy of the d30 DM Companion at Lulu. Cyclorcs are a slightly larger cycloptic version of an orc. 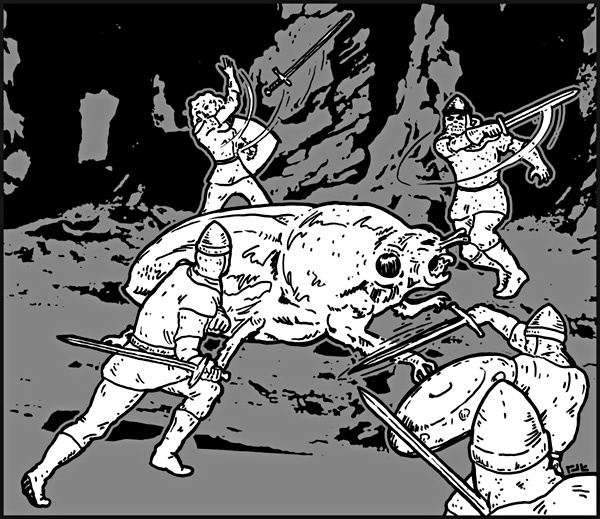 While they are stronger than normal orcs (having a +4 bonus to their HD and fighting/saving as 2 HD monsters), their cycloptic sight gives them poor depth perception and all “to hit” rolls are made with a 1 point penalty. Furthermore, like normal orcs they are nocturnal and prefer to live underground, so they must subtract an additional an additional point from their “to hit” rolls while fighting in daylight. Cyclorcs tend to the same weapon choices as normal orcs. 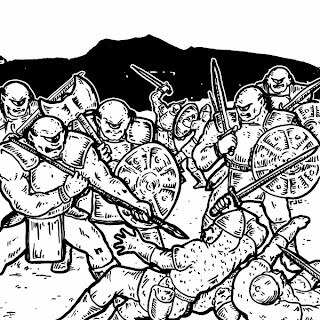 Cyclorcs have a temperament similar to normal orcs (have bad tempers, kill for amusement, hate elves and will attack on sight). They are, however, much more independent than standard orcs and will rarely serve in any type of organized military, regardless of the strength, charisma, or alignment of the group’s leader. Instead, they prefer to roam in loose bands (small tribes) comprised only of other cyclorcs. When 12 or more cyclorcs are encountered, they will be accompanied by a leader with 4 HD (will have at least 1 hit point more than the other strongest member of the group), that fights as a 4 HD monster and saves as a 4th level fighter. If the leader of the group is killed, the morale of the other cyclorcs becomes 7 instead of 8. Cyclorc tribes usually live underground (80%) or above ground in crude wooden huts (20%). For each male cyclorc in a tribal lair, there will be one female, and for each 2 adults in a tribal lair there will be 2 whelps (cyclorc children). Additionally, there is a 50% chance for each family unit in a tribe to possess 1-4 slaves (except elves). Cyclorcs prefer not to have ogres or trolls among their number. In addition to speaking the standard orc language, cyclorcs have their own dialect which few standard orcs understand (10% chance for standard orc leaders or better only). Additionally, most cyclorcs are able to speak the languages of goblins, hobgoblins, and ogres as well as their alignment language (lawful evil). The rolling green fields of Orlea, normally aglow with soft sunlight, are blanketed with gray. Clear blue skies have given way to the dismal haze of threatening dark clouds that drizzle cold rain and sleet over the area. The source of this recent and everpresent gloom is a mysterious tower of ice on a small island in the center of Inverlock Lake. The slender, frosty peak supposedly emerged from the ground and over a few weeks has risen to a height of well over 500'. No one seems to really know what the tower is or why it appeared, but whatever is happening can’t be good. 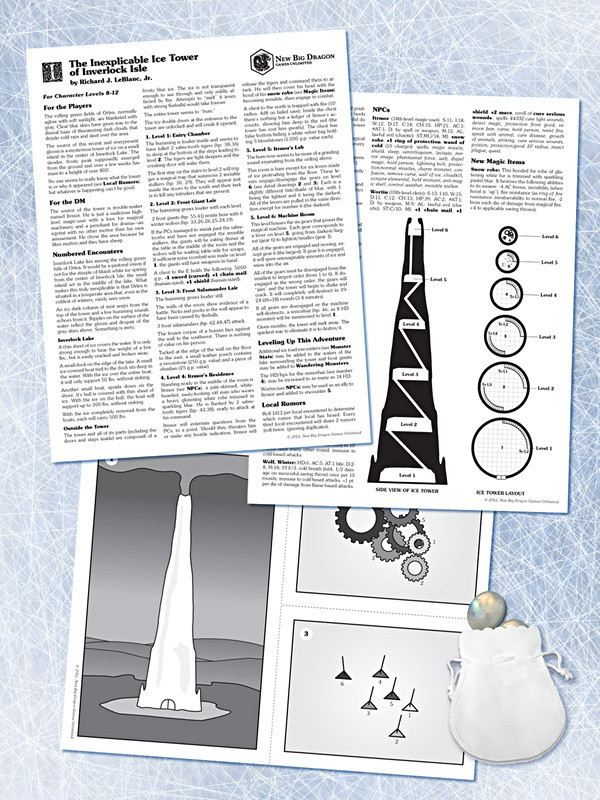 Click here to download "The Inexplicable Ice Tower of Inverlock Isle" from MediaFire. As per my previous 1K-interval blog posts, I have to thank Chris's Compendiums of Free Role-Playing Games, John Kim's Free RPGs on the Web, and Rob Lang over at 1KM1KT (1,000 Monkeys, 1,000 Typewriters), all of whom have taken on the vocation of helping rule-makers and home-brewers to get their work out there. Rob even goes above and beyond, working double-duty with the 24 Hour RPG competition, and triple-duty with the Game Chef competition. To buy a print copy of The System from Lulu, head over here. 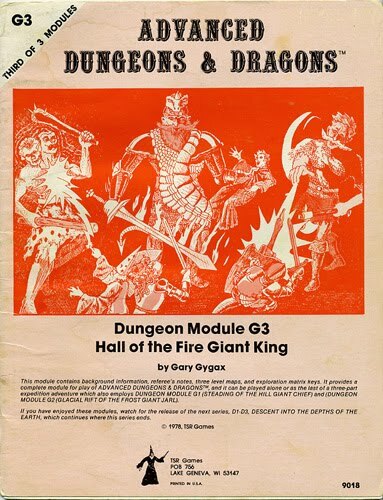 Yes, you rhombic triacontahedronites... the PDF of the d30 DM Companion is now available at RPGNow! For 30 days, it will be selling for the introductory price of $3.00. At the end of that time, it will go to its normal price ($3.95). If you check out the previews at RPGNow, I urge you to check out both the flash quick view and the full-sized PDF. Each of them features different parts of the book. 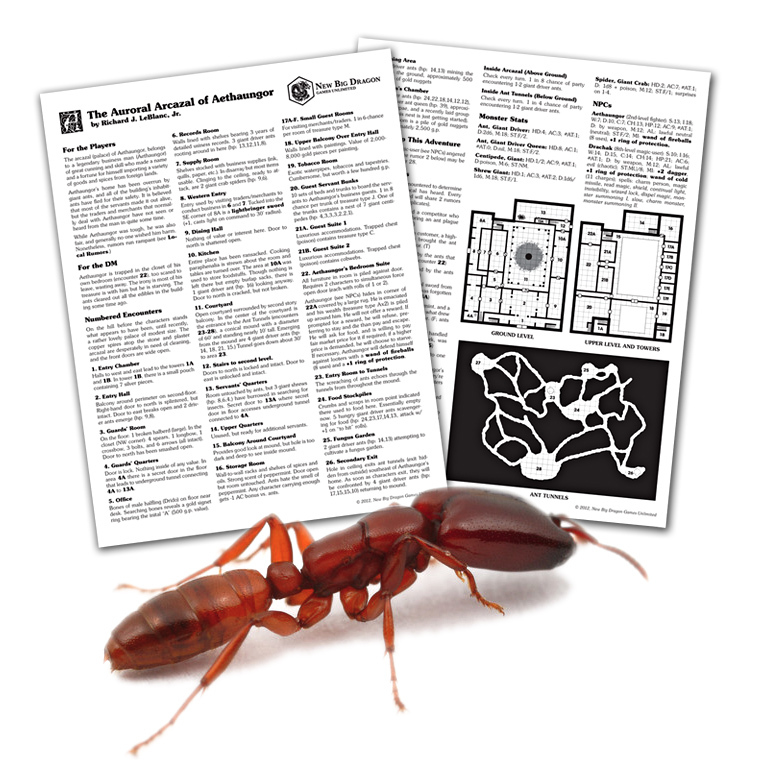 The PDF has been optimized for digital game table application (e.g., on an iPad). Anyone who bought the print copy (AND EMAILED ME W/ THEIR LULU ORDER #) should have already received an email with the link to your complimentary copy! If you don't see the email from RPGNow, check your spam folder. If you still don't see it, email me and I'll send your link directly. If you haven't emailed me yet with your Lulu order # (for your purchased print copy), email your Lulu print copy order number to d30dm1@newbigdragon.com and I'll send you a link to your free PDF copy. FREE SHIPPING TODAY ONLY (MAY 25) AT LULU! THERE'S A FEW D30 BUTTONS LEFT! 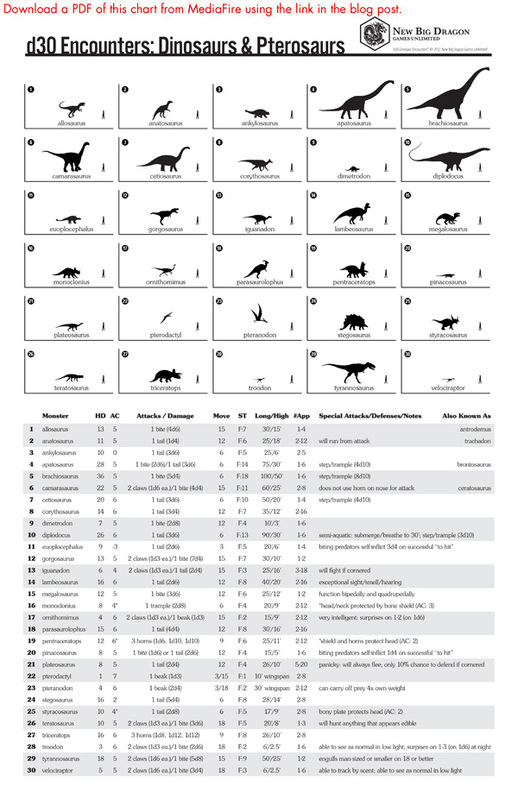 Let's face it, when it comes to dinosaurs, "you can't tell the players without a program." And forget about trying to look at the length of the damn things in correlation to their hit dice, and then guessing the basic shape of the dinosaur from the number of attacks or special armor class conditions. And then there's the fact that what we used to call the "brontosaurus" in the 70s and 80s is now officially the "apatosaurus." 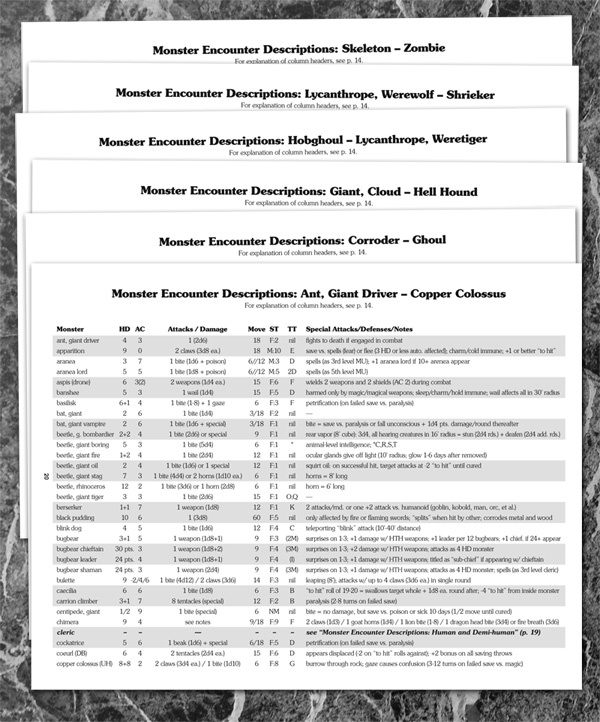 This NPC Record Sheet had originally been intended for the d30 DM Companion. However, as things started to fill out for the concept of the d30 Sandbox Companion, it seemed like a much more natural fit there, given all the various NPC generators that are planned for inclusion (like the recently posted Sage Generator). 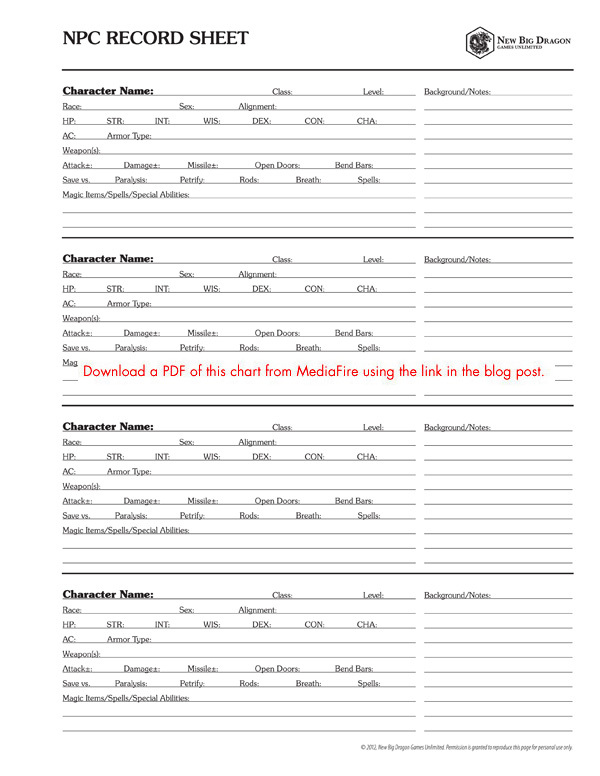 To download a free PDF of this NPC Record Sheet from MediaFire, click here. Instead of the standard dark fuzz that covers similar species, these huge spiders (about 3-4’ long) possess a rubbery skin colored fiery red and covered in strange, boil-like sores. The venomous bite of a taroltula (save vs. poison) does 1-8 points of damage and produces the effect of an intense burning sensation throughout the body of the bitten creature. Any creature affected suffers a -3 “to hit” penalty for 3-16 turns. 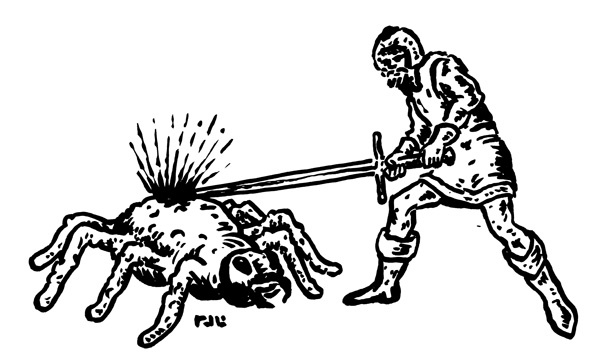 On any successful “to hit” against a taroltula using an edged weapon, there is a 10% chance per point of damage that the attack will rupture a sore on the spider, with each ten points automatically rupturing a sore (e.g, 24 points of damage would rupture 2 sores automatically, with a 40% chance of rupturing a third sore.) Each ruptured sore produces a spray of acid that does 1-6 points of damage. All characters standing within 5’ of each rupture must make a successful saving throw (vs. breath weapon) versus that individual sore rupture or suffer damage accordingly. If you'd only read this blog for the last week or two, I could see how you might think the only die I own is a d30. And while I am quite proud of my d30 (#1 in the picture above), it is by no means the favorite of my dice, though it is among the echelon. I thought that, in fairness to my other dice and gaming interests, I would feature several dice in my collection, most of which are reaching the age of retirement. 1. This is the 1982 smoky Armory precision d30 that I wrote about in my very first blog post. 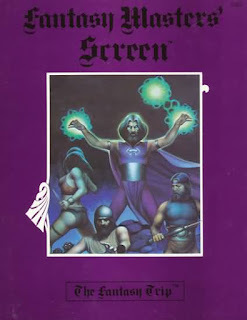 And while the idea of a d30-based pulp RPG system morphed into a d30-based mutant/barbarian/sorcery RPG system (an idea which I have not abandoned, only sidetracked), it is what launched me into what would become the d30 DM Companion. 2. My co-conspirator Dave Welborn got me these Traveller dice a couple of months ago. I've never really played Traveller (though some of my gaming buddies in high school in the 80s did), but I always dug the dice. I'd see the ads in Dragon, and think... "I gotta get those!" And finally, "I got those." Thanks, Dave. 3. This die, which features a teal dot on two sides, a red dot on two sides, and a yellow dot on the other two sides, came in a pack of mixed dice that I bought sometime in the late 80s. For years, I've been trying to develop a basic resolution mechanic that would use dice like this. And when I discovered the Toss Up dice, I thought I'd figured it out. Honestly, it's the same concept as Fudge's +/- dice, but does not support the simple addition/subtraction. I'm going to figure this out one day! 4. There's nothing special about these d10s from the mid-90s, except the concept of three opposing forces (in this case, physical/mental/spiritual) which spurned something that evolved into The System: Expanded, the foundation system for Starmasters. It's amazing how the simple purchase of dice could spawn an entire game system concept. 5. I love the old orange d6s from the Avalon Hill bookcase games. 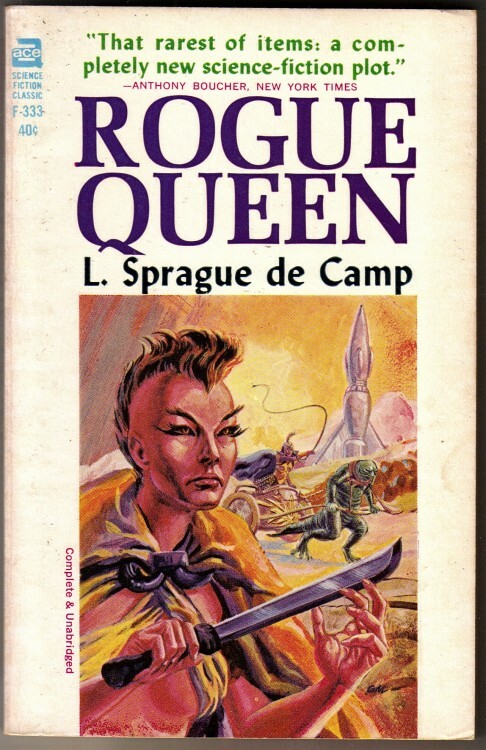 One of these came from Amoeba Wars which has, in my opinion, one of the most awesome pieces of cover art... ever! Hell, the cover art alone is why I bought the game. 6. I honestly can't remember where these green d6s came from. I'm guessing some other boxed game, either an RPG that uses d6s, or another bookcase game. But unfortunately they're just not as cool as the orange ones. 7. 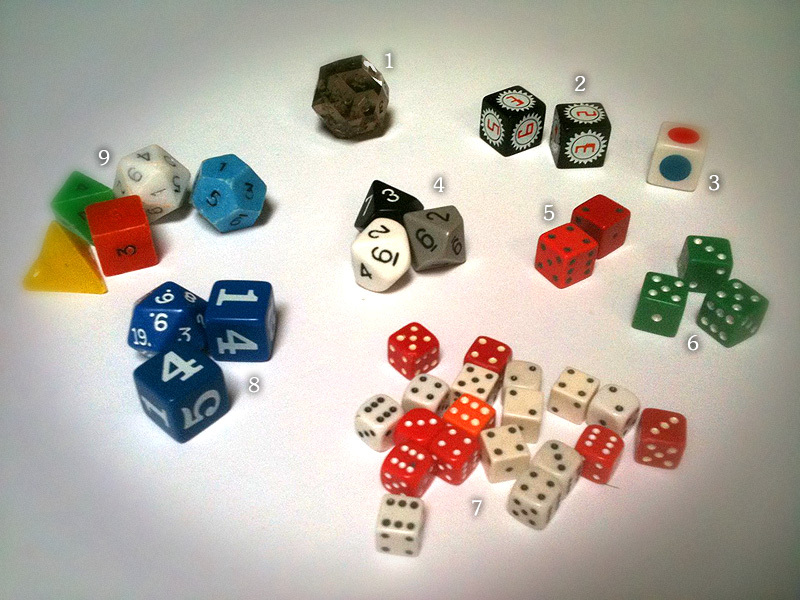 These tiny d6s came from a variety of games, but I didn't use them for those games. Everyone in our Champions group in 1985-6 had their own personal fistfuls of dice (which, if you've never played Champions, is pretty much a requirement for higher-powered characters) and these were mine. There's nothing like rolling a couple of dozen dice, adding up all the stun damage, then picking out the 6s for body damage. That mechanic alone is why we played Champions and never looked back at V&V. But looking back now, I prefer the older-school vibe of V&V and, as I've mentioned before, would love to get a V&V group going. 8. Like the d10s, these dice are newer. But they've become my Starmasters playtest dice. And hopefully one day, they'll become my Starmasters convention demo game dice. 9.Yep. Those of us that have these love them. But here's the odd part... I did not get them in with Holmes Basic. 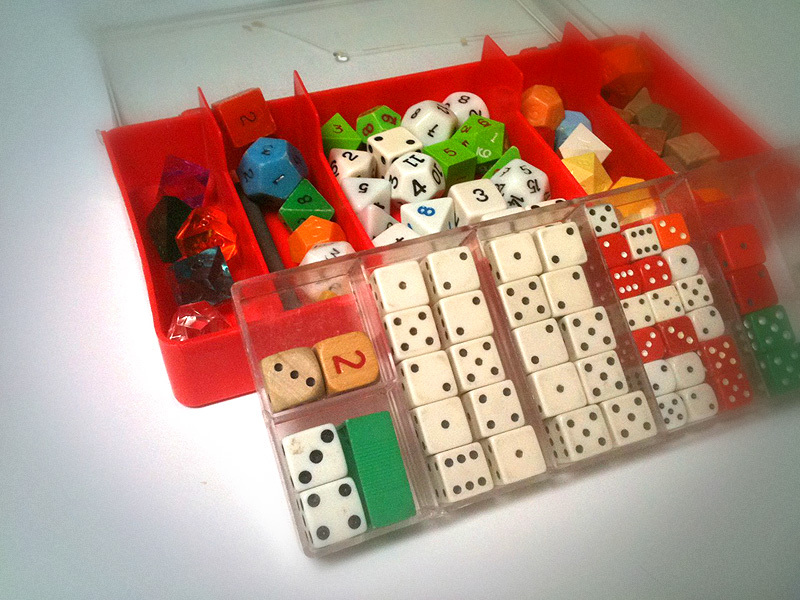 I started with the Moldvay set and own the "mud" dice that came with the red and blue boxed sets at that time. Like Grognardia James, I bought my set of low impact dice from Kay-Bee Toys. I own a lot of newer dice sets, and plenty of other dice, but keep most of my older dice are housed in this (below), a re-purposed tackle box purchased with S&H Green Stamps. After I lost most of the lures that came in it, I threw the leftover lures in my dad's tackle box and... voila! Dice box! That's right, the Lulu sales ends today. And knowing Lulu, it will be a couple of months before they have another site-wide sale like this. So get your print copy of the d30 DM Companion. All who order a print copy will get a free clickable PDF version; simply email your Lulu print copy order number to d30dm1@newbigdragon.com, and we'll send you the PDF when it's ready. PLUS!!! I have a few free buttons left. So remember to request a free button when you email me your order info for the PDF and include your snail mail address. And if there are any buttons left when I receive your email, you'll get one! UPDATE ON THE PDF VERSION: We're close, but have some link/zoom issues to resolve. I'll have an update of some sort for you in the next few days. Let's face it, if you follow the normal treasure type indications for the various monsters in your dungeons, that's a lot of damn dice rolling. Let's look at type A as an example (per the 1e MM). To start with, there are 8 categories of treasure (copper, silver, et al) that each require an initial percentile roll to determine whether each type is present. Then, assuming each type is present, there's another 8 rolls (1 for each type) to determine quantity. Then there's more rolling for type of item, etc. In the d30 DM Companion, I've created a treasure type generator that combines each of those "double rolls" (1=yes/no, 2=quantity) into one roll for each category, based on treasure type. And when you combine that with similar gem/jewelry and magic item generators, it really speeds up the process. 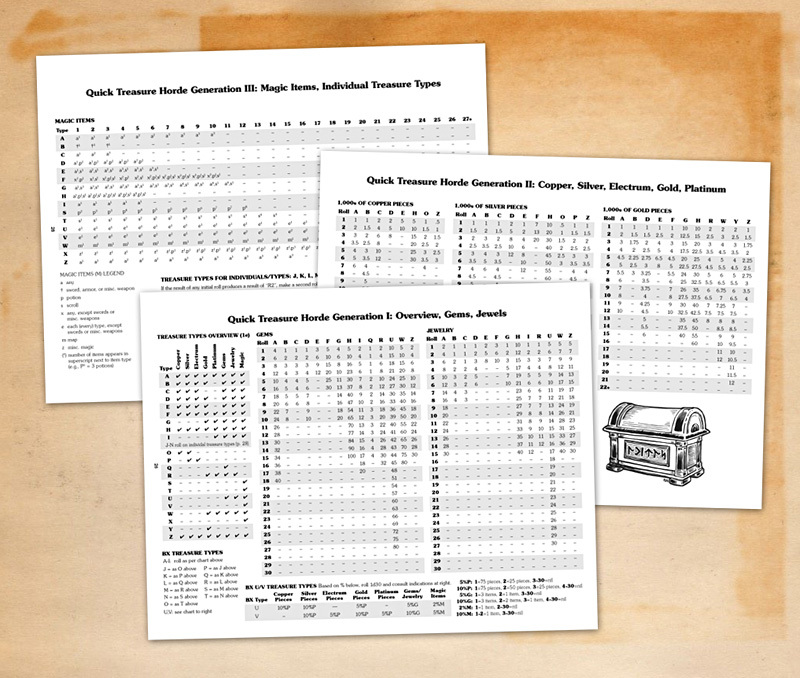 There's also a BX to 1e conversion table, so anyone playing BX can use these same charts to create a comparable treasure horde, based on the treasure types listed in the BX rulebooks. JUST A REMINDER LULU'S 20% SITEWIDE SALE IS STILL ON! My co-conspirator Dave Welborn and I are scheduled to get a working version of the clickable PDF ready by tomorrow. With any luck, we'll get that version done and available through RPGN/DTRPG by this weekend (maybe first part of next week.) Remember, anyone who buys a print copy will receive a FREE copy of the PDF version. 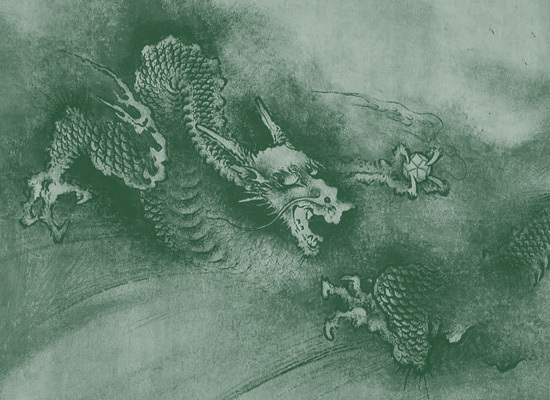 Simply email your Lulu print copy order number to d30dm1@newbigdragon.com, and we'll send you the PDF when it's ready. 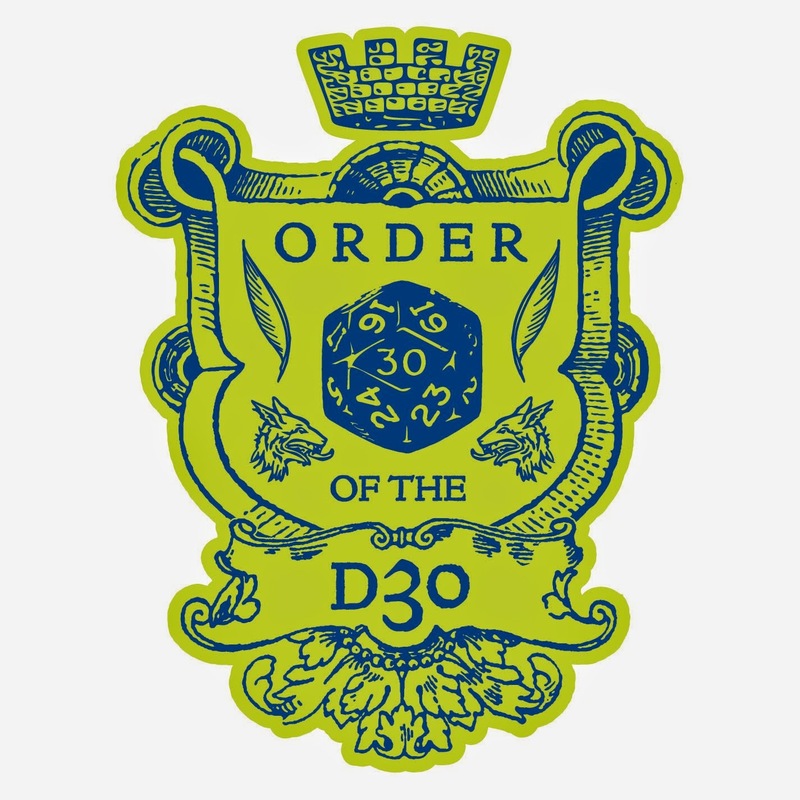 While supplies last (I'd set 30 aside), buyers of the print copy get this 1" button designed featuring a white illustration of a d30 on a green background color to match this d30 Companion edition. Simply request the button when you send your Lulu order number for the PDF copy, and I'll snail mail you a d30 button (again, at no additional cost to you.) And if you buy multiple copies, I'll send multiple buttons! 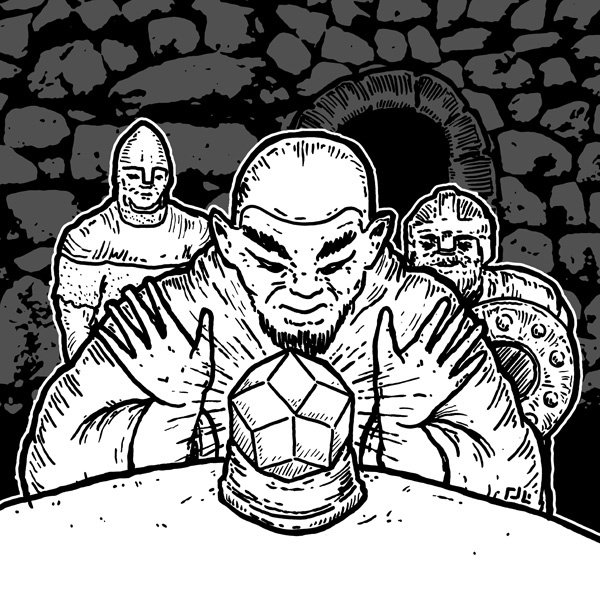 And if you've stuck around and read this entire post, this is a sneak preview to let you know that upcoming I'll be hosting a bit of a contest to win a free copy of the print version of the d30 DM Companion. Stay tuned for details!!! 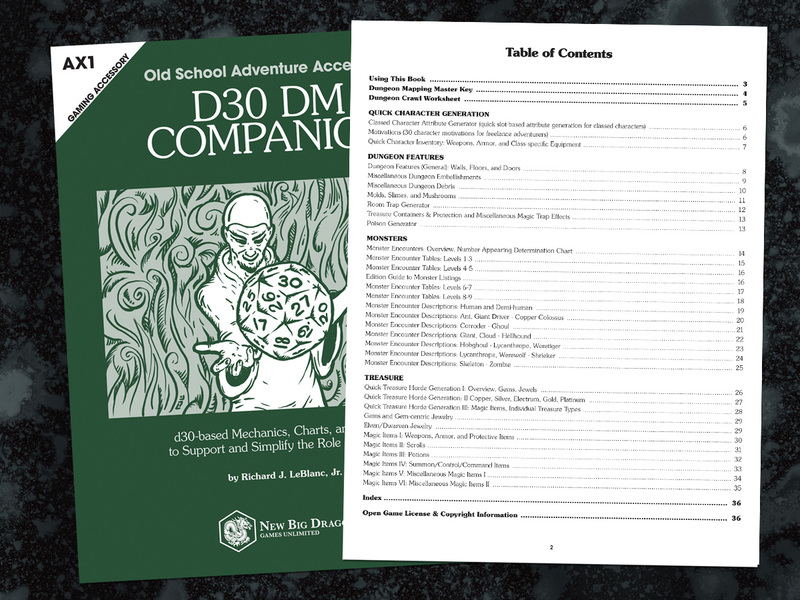 A Look Inside the d30 DM Companion (Print Version Now Available! 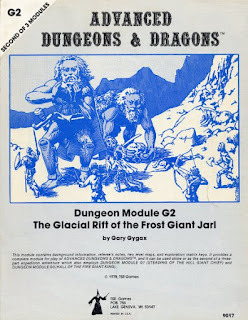 ): The OGL and "Protected Intellectual Property"
The monster description pages note above are one of the reasons that the d30 DM Companion and a d30 are pretty much all you need to stock a dungeon. Including generating general dungeon features, traps, and treasure. Think of it as the Monster & Treasure Assortment books on d30 crack! GET YOUR COPY DURING LULU'S SITEWIDE SALE! We're currently trying to finish up the interactive PDF copy, but anyone who buys a print copy will receive a FREE copy of the PDF version. Simply email your Lulu print copy order number to d30dm1@newbigdragon.com, and we'll send you the PDF when it's ready. And for the first 30 purchases of the print edition, I've got more free buttons! These 1" buttons are designed featuring a white illustration of a d30 on a green background color to match this d30 Companion edition. Simply request the button when you send your Lulu order number for the PDF copy, and I'll snail mail you a d30 button (again, at no additional cost to you.) And if you buy multiple copies, I'll send multiple buttons. 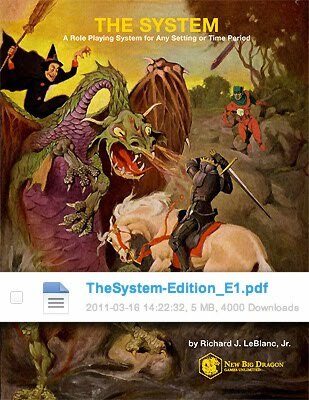 I'm happy to announce that the d30 DM Companion is now available in print from Lulu.com at an introductory price of $7.95. The Lulu page features a full visual preview of the entire book. Unfortunately, the Lulu listing is limited in character count, but yesterday's post features a bulleted list of the contents and if you click the image above, you can get a better look at the Table of Contents. AND LULU IS HAVING A SITEWIDE SALE! Thanks for your patience, interest and patronage! Happy rolling! PREVIEW: d30 DM Companion On Sale Tomorrow! IMAGINE BEING ABLE TO STOCK A DUNGEON WITH NOTHING MORE THAN A SINGLE d30!!! to assist DMs in mapping and stocking the rooms of their dungeons! There'll be an introductory price and some freebies for the first thirty folks who buy it! Regarding the "Ability Score Generation Scales" in the lower right corner of page 2 (yes, this is a 2-pager this week), the sage's class should be chosen to coincide with his fields of specialties (per 1e DMG.) The "slot" scores presented on the chart should be used in conjunction with the "d30 Class Stats Generation Method" tables found here. 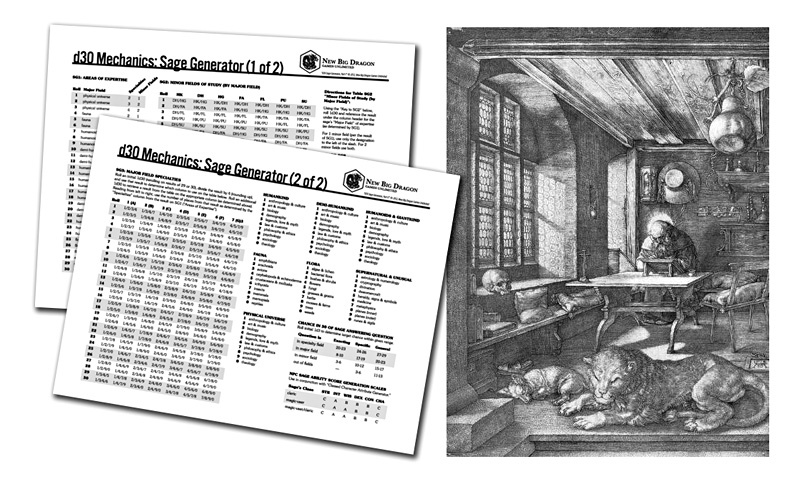 To download a free PDF of this 2-page Sage Generator from MediaFire, click here. Compete on New TV Show to be King of the Nerds to Win the ULTIMATE PRIZE! REPOST FROM A MOVIE/TV PRODUCTION MAILING LIST TO WHICH I SUBSCRIBE. Geeks, Nerds, Intellectuals, Gamers, Sci-Fi & Comic Book Fans, etc. - Compete on New TV Show to be King of the Nerds to Win the ULTIMATE PRIZE! COMPETE ON NEW TV SHOW TO BE KING OF THE NERDS! We are searching NATIONWIDE for nerds, geeks, gamers, intellectuals, comic book fans, Sci-Fi fans, D&Ders, or ANY TYPE OF NERD to be featured in a new major network TV show! Guys & Girls! You'll compete in all things nerd and showcase your geek skills for the chance at a HUGE GRAND PRIZE! From the producers of MYTHBUSTERS, SURVIVOR and AMAZING RACE comes a new competition based show King of the Nerds for TBS that will embrace and celebrate passionate and intellectual guys and girls 18-30 years old. * Are you a super fan of STAR WARS, STAR TREK, HARRY POTTER, LORD OF THE RINGS, BATTLESTAR or DRAGONS and WIZARDS? * Are you a GAMER who maxes out trophies and achievements? * Do you have an outrageous collection of TOYS and/or COMIC BOOKS? * Or maybe you're a huge fan of MANGA or COSPLAY? * Are you passionate about MATHEMATICS, PHYSICS, BIOLOGY, SPACE? * Do you build ROBOTS and write APPS and PROGRAMS for fun? * Do you consider yourself a MAKER or DIY person? * Have you been to Renfaire, Comicon or Gencon? * Do you compete in trivia based competitions? * Can you sing along to SHOWTUNES, OPERA, or hum a large repertoire of CLASSICAL MUSIC? * Do you know at least 50 digits of PI? * Are you obsessed with SUPER HEROES? * Are you a D&D or WoW fanatic? * Do you love everything SCI-FI? * Are you ARDUINO proficient? * Are you in MENSA? If you answered YES to at least ONE of the questions above, OR you consider yourself a passionate nerd and are between the ages of 18-30, then we want to hear from you today!!! Be a part of the show that embraces the nerd in all of us, and WIN THE ULTIMATE NERD PRIZE$$! Hosted by the original nerds 'Lewis and Boogie' from REVENGE OF THE NERDS, the movie! YOU MUST BE COMPETITIVE, PASSIONATE ABOUT NERD CULTURE, and READY TO WIN BIG! Believe it or not, it's almost ready! Technically, it's ready. I'm just not ready to announce that it's ready. If that makes sense. It seems like I just finished a month of posting new monsters. Oh. Wait. I did. I came up with this one too late for "F" day, but it's never too late to post a new monster. Right? Fluxbugs are usually found in abandoned mines and appear as giant silver beetles with a mirror-polished exterior. They possess incredible anti-magnetic properties and they seem to “hum” with vibration. Due to the warping a fluxbug causes in the other planes, it saves as 10 HD monster against all magical attacks, but saves as a 2 HD monster against all other forms of attack (including non magical fire, ice, etc. ), except electrical-based attacks, to which it is completely immune. Additionally, fluxbugs are immune any attack made by a metal weapon (bronze, iron, etc.,) including silver, and magic, and all missiles containing metal, with the magnetic field repelling all such attacks. Should any creature attempt such an attack, there is a 50% chance that any hand-held weapon will be “flung” from the attacker’s hand. For every creature within a 30’ range of the fluxbug, there is a 5% chance that any metal missile or “flung” hand-held weapon will strike one of those creatures, inflicting up to the full damage of the attack against the creature struck, including the original attacker. Should a creature wearing metal armor attempt to approach a fluxbug, they will be repelled as well. The bite of a fluxbug contains a toxic metal substance (akin to lead or mercury) that will kill in 4-5 turns (unless a successful saving throw vs. poison is made). In lieu of having any time to put together a real post for today, here are a few images of some items I've picked up over the last couple of weeks. I know that the G modules and the DM screen are later printings, but it's still nice to have those items in the collection for a very reasonable price. 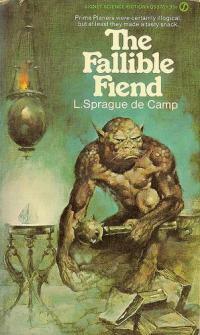 Seeing as I hardly have time to post, who knows when I'll get a chance to read the de Camp books. 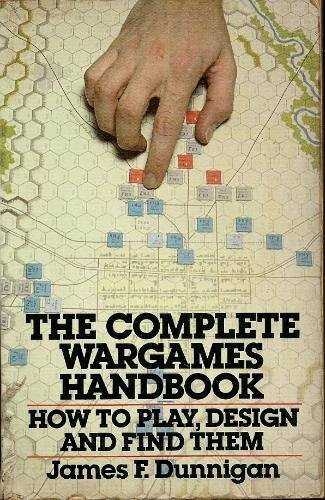 The sad part is, I'll probably end up reading "The Complete Wargames Handbook" first. Normally, Friday is "d30 Day" at Save vs. Dragon, but I've been terribly consumed with work and the d30 items I'm prepping (with an eye on the d30 Sandbox Companion) are fairly involved and taking much longer than I expected. As I mentioned Tuesday's post, I had originally intended "a dungeon a day" for the A-to-Z challenge... until I realized how absolutely ludicrous that would have been to attempt. I did, however, get the first one pretty much done. So with a few tweaks and a few additions, I've finished it and am uploading it for all to enjoy. 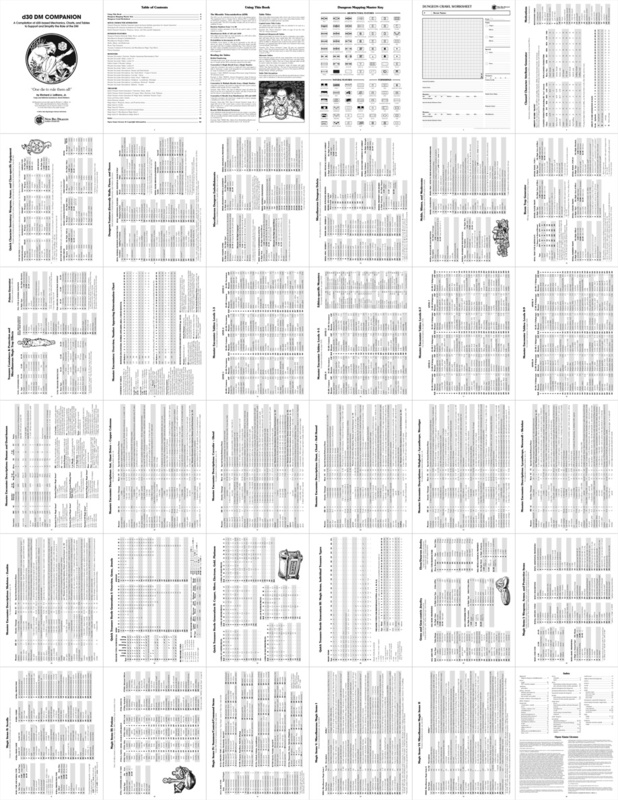 NOTE BEFORE FOLLOWING LINK: MediaFire's PDF browser viewer is very buggy and very inadequate. Be sure to hit the "download" button, save the file to your desktop, then view it from a better PDF reader like Acrobat Reader or Preview. Click here to download "The Auroral Arcazal of Aethaungor" from MediaFire. 1. It wasn't as challenging as I thought it would be... this go 'round. Honestly, once I'd settled on the A-to-Z new monster thing, it wasn't all that difficult, especially compared to my original A-to-Z intentions (a 1-page-dungeon-a-day). I do have to admit that I had many of the monster posts already completed and "in the can" before the month began, but many of them weren't. Monsters that were prepped (offline) before the challenge: zathoa, xanther, whipwhirl, üuloch, taega, saleerandee, psi-bat, orling, izzoo, hibagon, firefox, emerald stinkbug, dwarf (red), batar, adarna bird. Monsters that I wrote up and illustrated during the challenge: yak-man, rarog, quickslime (illustration already done), nightmander, lithopede, kala, jenglot, giant generator, centaur (cyprian), batar. About half of the items that were unprepped when the challenge began did exist as a word (monster name) on a "to do" list before the challenge started, and the other half were discovered/decided/etc. during the challenge (usually the night before/the day of). Prepped listings only took a few minutes to post. Everything else took anywhere from 15 minutes to an hour to get illustrated, scanned, written and posted. 2. It was nice always knowing the subject of my next post. Here I sit facing May feeling like I have no idea what to write about next. Which isn't entirely true. Before the challenge, part of the reason this blog had a loose schedule for day vs. subject (e.g., new illustration/monster Tuesdays, d30 Fridays, et al.) was so that knowing what to write about wouldn't be a problem. And with a month off from my normal content, I have a backlog of ideas. For d30 day, I'm planning a "Plant Monster Generator" (very likely this Friday), as well as a "Lycanthrope Generator." And even though I just posted 26 new monsters for April, I have a handful more I'm excited to get up (that's what she said), including a giant anti-magnetic insect called a fluxbug (mostly because I love how the illustration turned out). There's also an "ink" article planned to complete the trilogy with the previous "paper" and "quill" posts. And I plan on participating in the 24-RPG design contest at some point, and posting updates on the day I undertake my attempt. Wait- what was that I said about feeling like I have nothing to post about? 3. It provided me with many new followers. I picked up nearly two dozen followers during the 30 days of the challenge. Many of those were folks whose blogs I already followed and it was nice to have them come aboard here. 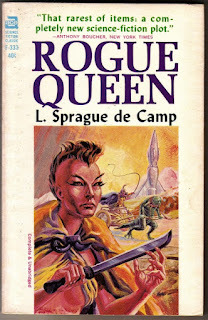 A few of those were RPG bloggers I had not yet discovered, but now follow as well. But I don't exactly credit those to the A-to-Z list. I believe most of them came to this dragon's lair via ADD Grognard's Eternal Keep, and I can't begin to give him the credit he deserves for what he's gone through to keep that OSR beast fed!!! Thank you! I did also pick up a few "random" bloggers who accepted the added A-to-Z challenges of: 1) visiting every site on the A-to-Z master list, 2) posting comments to a number of those sites, and 3) joining some of them. So welcome to you as well. 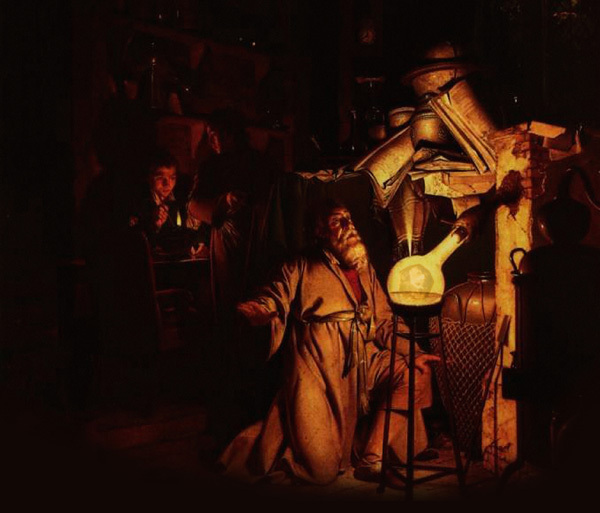 Your next challenge... learn what the following letters mean: OSR, Oe, 1e, and BX. You'll enjoy this blog a lot more if you do. So will I do it again next year? As me again next year.